Anyone that knows me (or reads here) knows that I struggle with weight issues. I mean, I was born weighing over 10 pounds for crying out loud! As a Biggest Winner contestant my focus was the scale. We had an official weekly weigh-in and whatever number popped up on the scale was recorded in our medical file and was a major component over who would win the competition. 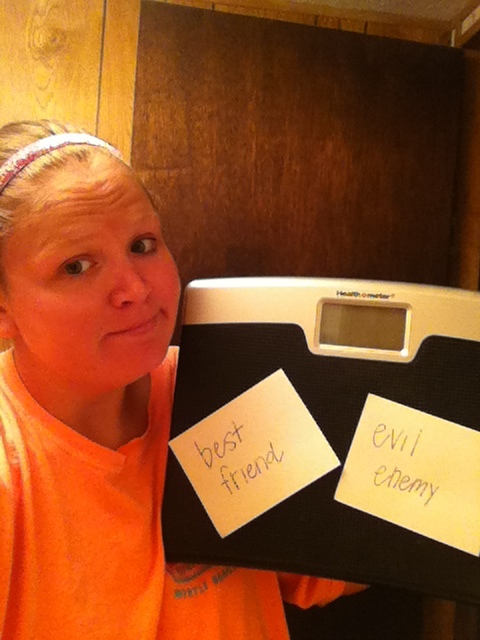 The scale was my best friend and my worst enemy. It defined me. During the program I worked so hard to successfully lose 37 pounds, making it 57 pounds total gone from my highest weight ever. I will never forget the day I stepped on the scale and saw 199 and then proceeded to weigh myself close to a dozen times after to make sure it was accurate. Just a few days later it would read 195-my lowest ever. That number told me that I was successful, that I was valued, that I was full of worth. But it lied. The day after the Biggest Winner was announced I went on a trip to Nashville and probably had one of the worst binges to date. I had reached what I deemed to be success and that was enough for me. I attained the magic number and that was all that mattered. In just a few short months I would pack on every pound again and be right back where I started. Then the cycle would begin again. I made the UT Rowing team and spent endless hours a week training and conditioning my body. Although I never really weighed myself that much when I was rowing, my body was stronger and smaller than it had ever been before and I didn’t have a care in the world about what the scale said. I was proud of having a 5k PR, I was proud of running 8 miles with no walk breaks and I was proud to have toned muscles. A number would not have made me feel any better. sad that it doesn’t say the number I wanted. What happened to that girl? I went from being scale obsessed to only being proud of my accomplishments back to scale obsessed. Every single time my friend Jess and I get together we talk about the scale. It is like the big elephant in the room that haunts us and never lets us forget about our weight and food issues. I’ll be the first to admit to being a compulsive scale girl. It is the first thing I do in the morning. Get naked, weigh myself, use the bathroom, weigh myself, hate the result, hate myself. Mind you, I don’t do this every single day but most days that is the cycle I go through. But the number doesn’t represent how much muscle I’ve gained from my strength training workouts, it doesn’t reflect how much fiber I have added to my diet, and it doesn’t tell me that I’m a better person. It is just a number. A three digit number that happens to have a 2 in front of it. Who cares?! I shouldn’t but I do. After reading Ashley’s blog and seeing her adventures with a scaleless summer, I reached out to her and asked if she would mind if I did a similar post documenting a summer without the scale. She was so encouraging and was totally okay with letting me do this! This summer will be her third year doing it and that to me is dedication. Summer brings lots of things that may not normally happen during the other seasons. Cookouts are plentiful and s’mores make the best dessert. Vacations and road trips happen and sometimes “healthy eating” gets put on the back burner. A lot of people would argue that it is all about planning ahead and making sacrifices and I respect that. But for me personally, sustainability is key to a weight loss that has longevity and by giving up special things that normally only happen in the summer just won’t cut it. I will end up feeling deprived and making even worse food decisions as a result. Is that an excuse? Maybe, but I know my body and my habits. I would much rather give in to a s’more and feel great about it than not eat one and end up eating three Dairy Queen s’more blizzards on the way home. A lot of people use the summer to maintain and not gain which I think is totally awesome. If I make it to the end of summer without weighing and still weigh the exact same then I will be super excited. If I happen to gain a few pounds, then that is okay, too. If I step on and see any loss then that will just be a bonus to me getting over my scale obsession. This summer is all about feeling good about myself, trying new things, and focusing on bettering myself and not about bettering a number. So here’s the deal. I weighed myself on Sunday morning and the scale said 228.8. 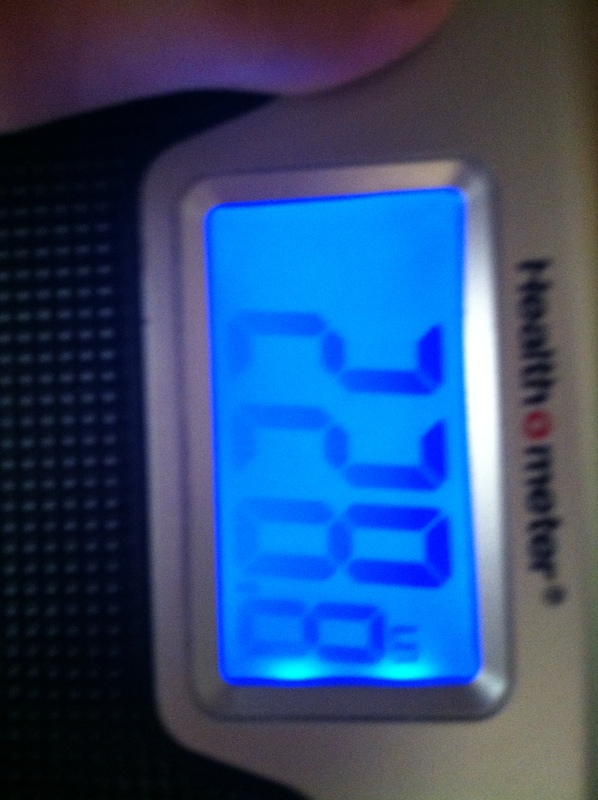 It has been a long time since I’ve been in the 220’s! The scale will be collecting dust until Labor Day. Sure, I have a goal number I’d like to see when I step on the scale again but I will be fine no matter what it says on September 2. The next two-ish months will give me time to build muscle, burn fat, work on my fitness, try new things, eat “summer” foods, and stepping outside the box. Can I do it? Yes I can. If you struggle with scale obsession, then join me for a scaleless summer! If you can’t bear to make it the whole summer, then scale (pun intended) back to one day per week. This is going to be a fun summer!! This entry was posted in Weight Loss and tagged not weighing myself, scale obsession, scaleless summer, weight loss by thegogirlblog. Bookmark the permalink. You can do it! I often tell those in my challenge groups to forget the scale for awhile and focus soley on the program they are doing and getting stronger. The scale only gives a numerical value. It does not determine your value. So proud of you! You know your habits and you know what you are capable of. Excited to watch your journey. You are a rock star! Exactly! Numerical value doesn’t compare to our worth! 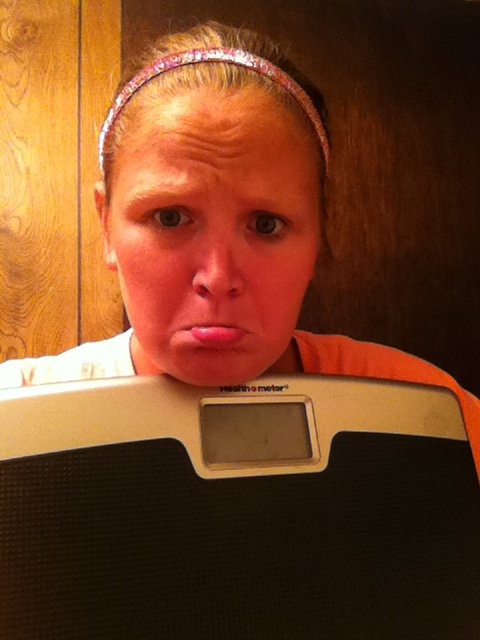 Personally I don’t remember the last time I weighed myself (maybe because my scale died on me… Darn!) but I definitely have scale anxiety, that number stresses me out so much, even if I gained 5 lbs the day that I end up running a 10k pr, I’m more likely to remember that I now weigh 165 and not 160. So I can absolutely relate. I definitely will be participating in a no scale summer also! I love seeing your strides girl! Keep it up! Scale anxiety is such a strong issue in a fitness minded world today. And I TOTALLY feel you on the comparison of the 10k PR and the scale. I used to weigh myself over and over and over before and after races and was always so incredibly sad that somehow I would gain 4-5 pounds during a race, especially if I ran a really good race. Just goes to show that the scale doesn’t determine our success! I’m so glad you can relate!! It scares me how much power the scale has over people, women especially. When I decided to hide my scale and stop weighing multiple times a day, I hated myself a lot less. I enjoyed life more. And when I finally stepped back on, the number didn’t really impact how I felt one way or the other. Good luck with your scaleless summer! Maybe you’ll end up not even missing it and going longer! This sounds like a great idea to me! Do you obsess over the scale? I’m guilty but will try to give it up for the summer! Love this idea!!! I’m doing it! Very cool idea! Thanks for sharing. I’m sure you are going to feel great. Celebrate the summer! Summer rocks, right? No need to have weight issues!! You’ve got this! I love the determination and happiness in your posts! You AMAZE me all the time! Honest, Smart, and Strong!!! The scale absolutely used to determine my mood for the day, oye. I actually started to see more weight loss when I let go of it and started to focus on all the good things about my body like the fact that it could run!! Turns out being positive is really helpful to weight loss, ha! KUDOS to you!! Really? Thanks for sharing because that gives me so much hope! Part of me worries that I will eat more since I won’t be scale focused, but so far it is working out good! Being positive is such a beautiful thing!! AMAZING!!! I love this idea! I’m in! Seriously battled weight my entire life and those numbers made my day happy, but usually sad and defeated!!! Yes, please join me! Loving all these ladies so willing to give up the scale and celebrate their successes and non scale victories. We rock! Please let me know how it works for you as I would love to share the journey with others!